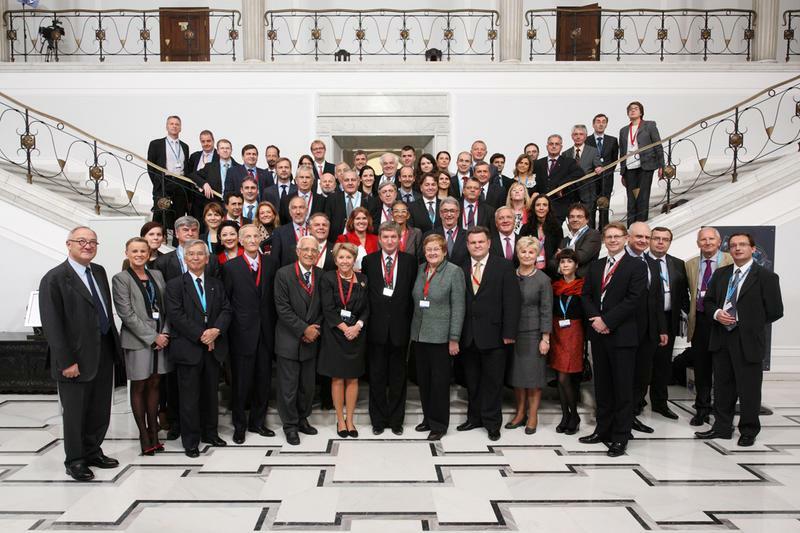 GOOGLE TRANSLATE TO ENGLISH from original on line : : Debated for the 14th European Conference on Space EISC Monday, 22 October 2012 16:09 The meeting was held under the theme "Space Sector and Sustainable Development". During the meeting discussed, among others the issue of stimulating the development of the Earth by advances in space and the use of space applications. The meeting takes place in the framework of the Polish Presidency of the European Conference on Space. The proceedings opened Sejm Speaker Ewa Kopacz. Participants in the debate discussed the global research management space, the possibilities of their use and sustainable development of the space industry. Speakers include represented by the United Nations Committee on the Peaceful Uses of Outer Space (COPUOS) Yasushi Horikawa, the Organisation for Economic Co-operation and Development (OECD) Claire Jolly, and the European Space Policy Institute Peter Hulsroj. Japan's Deputy Foreign Minister Hamad Kazayuki spoke about his country's involvement in space science and support for space policy. He stressed that Japan regulates activities related to the exploration of outer space law. Kazayuki Hamada said that the exchange of information between parliaments is an important part of space policy. The UN member states cooperation in the study of the cosmos said the chairman of the UN Committee on the Peaceful Uses of Outer Space (COPUOS) Yasushi Horikawa. He stressed that the space science, earth observation and climate research is an important field of international cooperation. Chairman of COPUOS pointed out that the UN Committee is an important international platform, which serves to as a forum for negotiation to take decisions on space. Yasushi Horikawa discussing the stages of a global research space ordinance added that it is important to support the development of sustainable and safe space. - Space is becoming increasingly crowded (...) we need to be careful - said the President of COPUOS. Claire Jolly representative of the OECD pointed to the economic development of space. Noted, however, that it is still small compared to other sectors. ASD-Secretary-General Jean-Jacques Eurospace Tortora estimated that the turnover of manufacturers of industrial space in Europe is 6 billion per year. He added that the manufactured products find their application mainly in science and the military. Regional development of the space industry representative discussed Rafa? Trzaskowski HERTZ Systems. He stressed that the creation of space sector could include Polish investors the ability to create interesting and responsible business. Prospects for the sustainable development of the space industry in Poland, raised the director of the European Space Policy Peter Hulsroj. He emphasized the importance of the space industry for the economy. He also added that sustainable space industry is self-contained and requires investments from public funds and the involvement of public authorities. During the 14th European Conference on Space EISC also raised the issue of European projects in a global context. The representative of the European Commission presented the idea of ? ?Rudy Aernoudt Global Monitoring for Environment and Security (GMES). Its aim is to create a means of monitoring the environment from the ceiling satellite, air and ground. The collected data will be processed in order to allow more efficient management of the environment and enhance the security of EU citizens. GMES consists of three components. The first is a space that allows you to obtain data from the satellite ceiling. The second is a ground-based component, that is, devices and instruments for ground-based measurements. The third is a data delivery infrastructure, the service component. - GMES allows for long-term continuous monitoring, free access to free information, common scales in all regions, as well as quickly update information - said Rudy Aernoudt. Growing market of GNSS (Global Navigation Satellite System) discussed the Permanent Representative of the Galileo Service Axelle Damp. The idea is to create a civil GNSS navigation system with global coverage. This investment will contribute to the economic growth of the EU. - We can not lose the opportunity that has opened up before us, it is a very important opportunity for today's Europe - Axelle Damp noted. Part of the proposed solution (GNSS) is a European satellite navigation system Galileo. The conference was presented the initiative to set up under the auspices of the ESA awards EISC "Cosmos space of sustainable development". Originators want to pay special attention to young people on the importance of sustainable development. Proposed projects should combine space and sustainable development, using them together in areas such as telecommunications or navigation.